I’m quite impressed by what these Chinese cloners can produce. As can be seen on this youtube video, there’s a nice typo on the boot-up screen (“tPhone”) and it does use the Windows startup sound(! ), but it is an otherwise pretty decent-looking clone. Time zone stuff. China has a single time zone for the entire country, which by itself is fascinating for such a huge area. And when looking at a time zone map, you can see that the country picked a time zone that is the equivalent of western Australia, which seems to be a lot of sense for the east coast of China. So, the western parts of China are terribly off. The question is: do the people ignore the time and follow the light, or do they obey the time and spend parts of the lives in more darkness than what they otherwise would? If you go north/south at the eastern and western edges of China, you’ll end up in time zones that are five hours apart! Chinese typing is with glyphs; some tens of thousands of different ones. In a Chinese dictionary, like a Chinese to English one, how do they sort the Chinese words? I mean, glyphs just have got to be very hard to sort in a logical manner?! Or how do they find the words? Microsoft hasn’t given in yet it seems, as they announced their updated Zunes yesterday. They’re available as 4 or 8GB flash and a 80GB hdd version, and these ones are claimed to play more movie formats (like h.264 and MPEG-4) and they actually seem to be capable of using the wifi for things like syncing music etc. The zune music is also said to go DRM-free… All in all, I’d say they seem to really make an effort to be a serious iPod alternative. Anyway, there hasn’t of course been any serious dissect of these new Zunes yet but given how their earlier models were made it seems unlikely that they will attract any larger crowds of eager hackers. They also seem to have applied a fair amount of cryptography, another Apple-like approach, so it is hard to put a replacement firmware on it. The guys in the Zune Linux project have really no clues about what hacking these things require, and their early chatter on deciding what logo to use and what “distro” to base their work on have just been hilarious jokes. I don’t expect this new set of models to change this situation in any significant way. 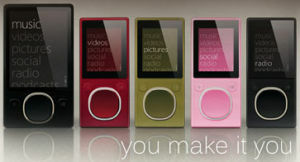 I’m not aware of any known skilled (Rockbox) hacker having a go at Zune. The old Zune models are however quite similar (but not identical) hardware wise to the Toshiba Gigabeat S models, for which there is a Rockbox port in the works (as I’ve mentioned before).